A couple of weeks ago, someone posted on Facebook a link to a summary of Marie Kondo's book, The Life-Changing Magic of Tidying Up. Have you heard of it? I had seen people posting about it here and there so I clicked through and was totally sold. If I wasn't as cheap as I am, I would have bought the book immediately. Instead, I went online and reserved it from my library and I am currently number 183 on the wait list, Yup, that's not a typo - ONE HUNDRED AND EIGHTY THREE! Just goes to show you how popular the book is. Now as is, just from reading the summary I have started DRASTICALLY getting rid of so much in our house that I feel like maybe it's best to not read the entire book. I might be living in an empty house if I got the book right now. That being said, if any locals have it and are done with it - go ahead and drop it in my mailbox! Anywho, back to the purging. So it sounds like part of the book is nutso (the sock chapter for those who have read it), but some of it really spoke to me. People have so much STUFF. Stuff that we don't need. Stuff that hangs over us and we just can't seem to let go of. Well let me tell you, I'm letting it all go. The gist behind Kondo's book (again, I haven't actually read it) is determining if your personal items "spark joy." Do they currently make you happy? That dress in the back of your closet that you spent way too much money on for a wedding years ago and have never worn again? Thank it for its service and the joy it brought you that night (thanking is a Kondo thing) and donate it. You don't need it. It's taking up space. Let it go bring joy to someone else. So I've started using the "Does it spark joy?" as I'm making my way through the house. I'm looking at things that I've held on to for years and years that I don't need or want anymore but just haven't been able to get rid of before. I came across a white pocket book and gloves that I wore on my First Communion. I've kept it since I was seven but you know what? I don't need it. There's no joy sparks there so I passed it along. The longer you hang on to things the harder it is to give away. I came across some glass decorations/knick knacks from one of my apartments when I was young and single. They were cute and they were nice but they're not me anymore. They are from another life that I lived before my husband and before kids. So I sat there for a minute, looked at them, remembered the great times that I had in the apartment with friends, I smiled, and I put them in the donate bucket. They don't want to sit in a box in my closet, they want to go live another life on display with some new, young girl. The memorabilia and the back of the closet stuff is hard to get rid of. You know what's not hard to get rid of though? The toys! So many toys and so little time for the kids to play with them especially come the fall when all my kids will be in full time school. 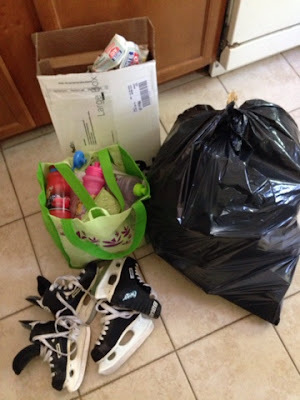 The kids have actually been coming to me this week offering up things to donate since they've seen me getting rid of so much. The purging is addictive. In the last 4 weeks, I've had a donation truck come pick up a whole bunch of stuff and have made 4 trips to a local second hand store to donate items. I went on Friday to donate items and was back again on Sunday. Once I've packed it up, I need it gone asap. I actually might have a problem but oh man is it freeing. I don't need 9 glass bowls or 12 assorted mugs or 7 plastic platters or 27,000 reusable grocery bags. I've been keeping the things that I use regularly and donating the rest. I can now easily find things in closets and cabinets and drawers. I might just become the poster child for someone who has gone completely insane but man will my house be organized when they haul me off to the looney bin. A Spring Time (Picture) Update!